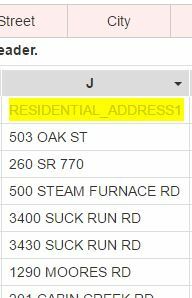 Set up map address fields. CSV-2-Geodata is a batch online geocoder software service. It provides live conversion of batch addresses into geographic coordinates (latitude and longitude). It is built with simplicity and flexibility to allow easy batch/batch geocoding. It accepts any type of address tokens, and process them into geographic coordinates with minimal interaction from the user. It provides very accurate online geocoding results. 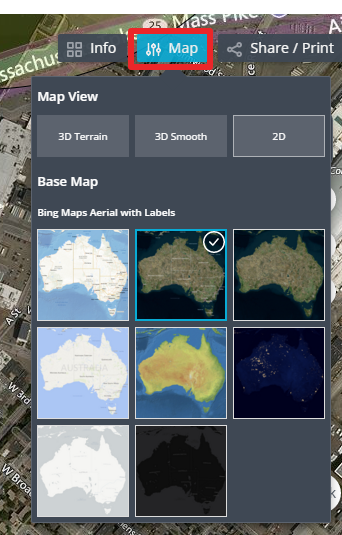 It does provide live, real time geocode conversion. It is built with responsive design - works natively well on laptop, iPod, Smartphone. It has unique authentication/authorization mechanism so user does not have to even remember its password. Question: Hi, My company is interested in buying geodata for approx 100k addresses. Would it be possible to pay for this via an invoice? Thank you. Answer: Sure that is not a problem.Do you know the exact number of rows you have?Under what email should we send the invoice? Question: Trying to pay with American Express Business card but for some reason the transaction is not accepted. Answer: American Express has restrictions on over 900 categories when comes to online payments via web sites when PayPal is used. We can send you custom invlice via email and that should work. Answer: The latitude and longitude that are coming out of csv2geo are Not projected. They represent the map as a round globe. In your case select WGS-84 when importing inside QGIS. Question: How many logins are allowed per sign-up (if we were to pay per month), and if multiple users can use the same login at the same time. Answer: We have developed a feature that helps with multiple users to work under same account payment. After you sign monthly, the master account holder can add via email other members of the team that are already registered on the site under this account. There are no restrictions on how many additional accounts you can create.Then each member can run at the same time any job they want. All totals are back to the master account against the monthly quote. If they want to have just one account, they can view and download at the same time with same account profile but will create an issue if they start generating geocoding tasks at the same time. There are a variety of areas where geolocation is used to facilitate, understand, drive, and improve the quality of life. 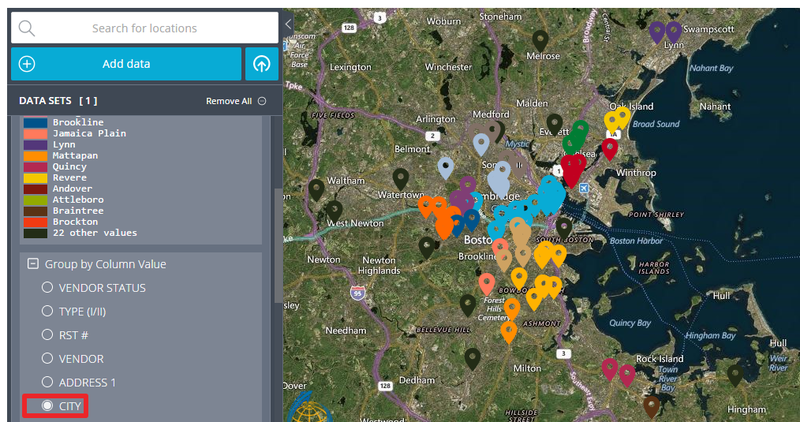 With the ability to capture and process data becoming an element of our daily habits, having batch geocoder analogous to CSV 2 Geo Data can assist first hand to gather useful data in minutes. Sometimes users register with couple accounts that are very similar and start mixing them. Answer:Yes, we can process your records in our cluster of servers. From past experience with clients like you, we know that the turnaround and price depends to a degree from the quality of your database. If the records are clean and not misplaced, etc.. we can start with small batches to make sure you are happy with the results and then rapidly run massive quantity of data. We will break the volume in chunks (phases) and will not move forward unless you are ok with already run data. Answer: You can load million records via single csv file. large files of that size take time but eventually will be rendered. You can run multiple files at the same time as well. Answer: Very accurate. 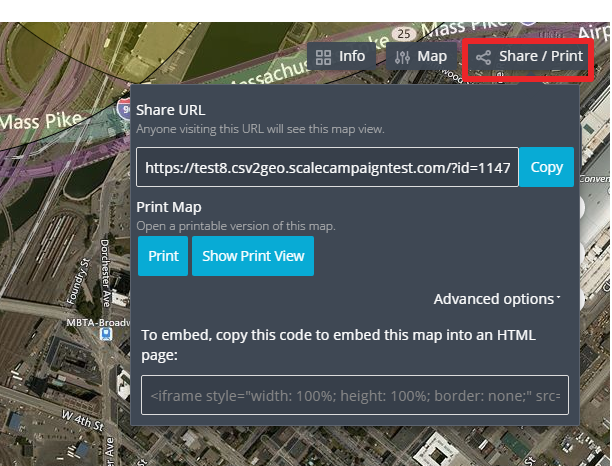 You can test it for yourself with up to 100 free addresses at csv2geo.com . We try to always give rooftop location back. When that is impossible we indicate the accuracy. Answer: The output file is always csv format. It is very easy to convert csv to excel. Question: Hi I have recently set up an account and paid $5 for a 450 count of data to convert their address to Lat Long.Does that me I have remaining 4500 count of data in my account left that I can convert in future. Also is there a way we can set up a business account and you can charge us centrally ? Answer: No, you do not have left 4500 count of data as you used pay as you go option.Whoever, you can subscribe by setting up business account for monthly usage if you want or continue using this account you can still subscribe. Answer: It looks like many of the cities were duplicated all over the map, not only in Nederlands. I run another batch for you with country added as additional column. Question: Hello--a fair number of columns are jumbled up in the output to the point where I am concerned about the accuracy of the data file. Is it possible to re-submit the same file to see if similar results come in (without additional cost)? Thanks..
Answer: Hi, definitely. Give me few min to look the file and process it. If I have any questions I will use this email for quick turnaround.........Hi, i looked the original input file you submitted and i think i know what happened. For example if you look row 4 , you can see that the secondary address with value "suite 120" was shifted to the right and ended inside the city cell. and the triggered reaction and other fields shifted to the right by one. Can you prepare another input file where secondary addresses are put in separate column or add the address column, i will run it for you and add the results to your work history account. This is the default login state of the application. Regardless if you are a registered user or never visited before, the login as a guest offers you full access to process geolocation data. The system is already set up for you to log in as a guest. There is no logout if you are logged in as a guest. Login, Logout as registered user. There are two ways that you can log in as a registered user. 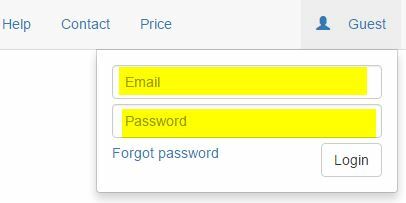 The first way is to enter user email and password. Click on the Guest link and supply registered already email and password. The second way is to click on a link inside an email with processed job sent to your registered email account. The system will automatically log you in with proper credentials. To log out, simply click on user link and select log out. The user can upload data from a local device - cell phone, iPad, PC, laptop, etc... also, the user also can upload data from the cloud if local device is connected to the cloud and offers upload capabilities. To upload data, the user drags and drops a file inside the designated file upload area or clicks on that area and then navigates to the desired file and selects the file. Csv2geo.com accepts only comma separated value type files . We limit the size of the file to 100 MB, as large files take an hour or more to process live data. For example, a voter file may consist of more than 100 columns per row, where 100 Mb file will consist of about 300,000 records. The user is liberated to upload the data file from any location granted by the device the user is using. For example, iPad or cell phone user may decide to use iCloud or similar cloud storage directly. After successfully uploading the data file, the following file properties are displayed: - Name of the file, including the CSV extension - Size of the file in bytes - Number of rows in the file. Geographical address is a complicated structure and over time nearly everyone takes it for granted. For example, just the street number may occasionally have 4-5 parts. Street name every so often may consist of 5-6 parts. At csv2geo.com, we look it differently. We separate an address into six major components (tokens) and give the user the ability to associate on the fly one or more file columns to single address token. One of the reasons geodata manipulation is expensive since the majority of the competitor tools will require either flat file template that restricts user of what input data to load or awfully inefficient file manipulation. The user has the ability at every point while setting up map address fields to clear the selection by pressing Clear address button. This segment indicates state name, province, or similar territory. Country or region that indicates a distinct area in political geography. If a country is omitted from selection, United States is used by default. When imported to csv2geo.com, a letter driven header is added on the top of the imported file data that will be used to mark selection inside address token segments. The user can select zero, one or more columns from the imported file to map to one of the six map filed address segments. To make the selection, use the tiny pointing down triangle type arrow. On the example for column J we might notice that street number and street name are combined into one column. Therefore, the user can decide to select under the columns both, the street number, and street name or just street using the tiny arrow in the right corner of the column. The system will indicate the user's choice by adding street number and street token under column J to indicate the selection. Also, column J label is placed under two address token - Street number and Street name. Regardless of whether the order of checks, user's choice are always ordered left to right. For example selecting street number and street name will be street number first and street name second. Similar to selecting the address token, in reverse order, the user may decide to deselect already selected columns in the address tokens. To do that, the user simply traces the letter from address token segment to which column represents in the data file and using the tiny arrow un-checks the selection. In order for the service to process imported data, a minimal valid address compilation must be selected by the user.For US, that could be just a zip file. If you select street, then you would need to select at a minimum, the city and zip code in order to process the data. A green button labeled Process appears.The Example shows a minimal selection of just a zip code. Clicking on Process button will process the first ten addresses and compile and display their geolocation. The data will be added to the right of the last column of the file inside the grid. The User could verify the accuracy of calculating data before buying it by examining the first ten rows. In case when the user is already logged in, PayPal/Credit Card payment page will be open, and the user has to fill the mandatory data to complete the purchase. Buy records as guest or non-logged in user. In case the user was never registered in the system, orcurrently is logged out, simply fill the open text box with your email and agree to the company policy and terms of services by checking the check box under the email entry. Finally, after submitting the email address and agreeing to the license, the user should receive an email on the email address that was supplied. The email contains a direct link to Working History page where the purchase needs to be finalized. Work History page is where the user can buy the actual data and download the desired result. There are two ways to navigate to that page. Clicking on the email link from your email you received after submitting desire to buy records will bring you to Work History page. Inside Work history page the user can pay to obtain the calculated geocoding results. By clicking on the Credit card button the user navigates to the credit card payment page. Csv2geo.com does not store credit card information. Also, csv2geo.com rely on PayPal to handle security and maintenance of the credit card payment process. By clicking on PayPal card button, the user navigates to the PayPal payment page. 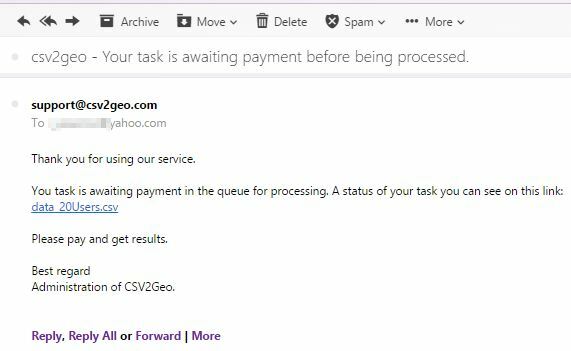 After successful payment, csv2geo.com starts to process the data. Depends on the size of the file it may take minutes to hours. The user can see the progress inside the Work history page. When the process is completed, the user will receive an email with a link to download the file. Also, inside Work history page the records will be available for download via a download button. download in order to start creating the map. The map will load intially with some predifined settings that you can change. Markers maybe grouped together and by zooming in they will show in more details. On the left is the menu settings. Group by column value segment of menu represent the ability to group map markers via any of the column headers from file you uploaded for geocoding. The system will automatically select each group with different color. In the exampe above the column header city was selected. Any unique value from that column received different color. and filter these markers out of the map if needed. Under the general settings you can load your own logo instead of Scale Campaign logo. You can set up double circle around choosen value.